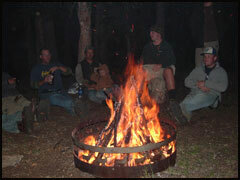 Join us for a traditional western-style tent camping experience in the spectacular West Elk Wilderness. You’ll enjoy bubbling mountain streams, scenic high mountain lakes, breathtaking views, wildlife, and magnificent summer wildflowers as you ride the trail to our base camp, located at 10,000 feet elevation. There, surrounded by the beauty of the Colorado wilderness you’ll enjoy a panoramic view of the Castles, an amazing rock formation in the Valley of the Castles. Our first-class camp is equipped with roomy 12x15 canvas wall tents accommodating up to five quests each and are furnished with wall-to-wall flooring, screened windows and doors, base camp style cots with mattresses, and solar lighting. 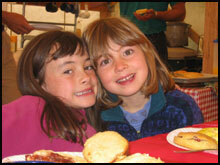 Delicious cowboy-style meals are prepared and served in a spacious 16x32 dining tent with wall-to-wall carpeting. A latrine facility, tack tent, and guide quarters complete the camp. 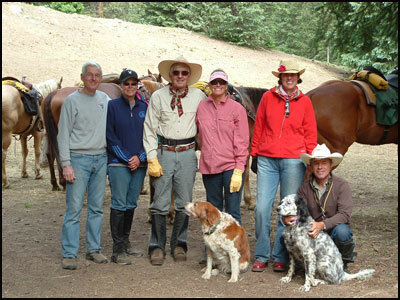 The two hour horseback ride to camp departs from the trail head at 1:00 in the afternoon. Upon arrival, take a hike, wet a line, or just unwind, relax, and soak up the fantastic scenery until the dinner bell rings to signal your home cooked dinner is ready. Afterwards, enjoy a relaxing evening around the campfire telling tales and listening to the howl of the coyote under the brilliant star and moonlit sky of the Colorado Rockies. After a good night’s rest, enjoy a steaming cup of cowboy coffee and a hearty breakfast before departing on a leisurely ride back to the trail head, arriving around 11:00 AM. If you’ve been looking for a unique, affordable vacation experience, bring your entire family and enjoy the magnificent West Elk Wilderness and the great western hospitality of Tenderfoot Outfitters. It’s an adventure you’ll never forget. These spots fill quickly, so don’t delay. Call today! This was our first time to experience an overnight pack trip as a family. It was really great to do something like this together. The advertising just doesn’t do it justice. You have to come and see it for yourself. Everything about the trip was first-rate. We’re looking forward to the next time. This trip was one of the items on our "Bucket List". What a way to go!!! This is the BEST! Thank you.